Digital technologies are playing a key role in the prevention and promotion of health and wellness. Where does Medipta fit into this? Nowadays digital technology is used in every field. Digitalisation has changed our lifestyle. Likewise, healthcare is also using advance digital technology to provide quality healthcare services. Digitalisation in healthcare has improved availability and affordability of not only medicine but also all healthcare related services. Medipta is an ultra-modern healthcare platform where every entity in healthcare is a beneficiary. Medipta has a facility of telemedicine and is promoting preventive health check-ups and e-health services with the help of health screening devices. This app aims at urban and rural healthcare management by providing e-health facilities at very affordable cost. What is your vision for healthcare delivery in India? Medipta app is here to offer the most reliable, hassle-free, transparent, convenient and cost-effective healthcare solutions to you. We are currently working on different projects to serve the urban and rural population. We are also working with various public sector units on health check-up plan which can be availed for Rs 30, Rs 50 and Rs 75. Medipta believes that it will generate more than 5000 jobs in the next coming years. Very few really solve the healthcare issue and many can’t make it big or even sustain their business model for long. What is your say? True that is. Healthcare is a vast sector in India and it has many challenges at every level. I cannot comment on other players, however, we got into the market only after a comprehensive research which has helped us to come up with a sustainable model in the existing market with our existing resources. Our research entailed us to come up with a 360 degree umbrella for healthcare where associations and collaborations would be the backbone of the business model and it will sustain as every player of the ecosystem would want to sustain. And we are strive not only to sustain but to make it a big for everyone. Tell us about your app and how it is solving India’s healthcare needs? Medipta is a web-based mobile app for all healthcare services. It is helpful for patients as well as all the entities involved in healthcare industry. Patients can get all healthcare services right from finding the right doctor, booking an appointment, medical insurance, to getting your medicines delivered right to your doorsteps. Doctors can get access to patient’s information and guide them accordingly. They can also maintain records of patient’s prescriptions. Chemists/ pharmacists can supply medicines to patients at door step and maintain e-prescription for patients. They can also get stock inventory information on this app. Test labs/ radiologist/ diagnostic centres can provide lab tests and diagnostic facilities to patients and upload reports online. Stockiest can supply medicines to chemists as per necessity. They can track their order as well. Insurance agents get customers through direct inquiry. Blood bank can update stock so it will be easy for everyone. People can connect with ambulance and blood banks any time and the ambulance can reach with the help of Google Maps. Fitness experts can give tips, tutorials and guidance for healthy diet through personal chat facility. Woman can track monthly period cycle. And at the same time complete pregnancy to understand baby’s growth week by week. Medipta is the 3rd venture in technology and 1st in healthcare. Before this, we have successfully managed six ventures in the span of 10 years. Explain to us your business model? Why is it different or unique? Medipta app is free for patients and doctors. We can avail free ambulance service, blood banks as well. Chemists, retailers, labs, hospitals, distributors and insurance agents are charged. Medipta sells diet plans also. Telemedicine and health screening devices enabled by mobile Bluetooth is an additional feature of this app. Medipta is using this feature for Arogya Setu which will promote rural healthcare management by offering affordable services at very cheap cost. 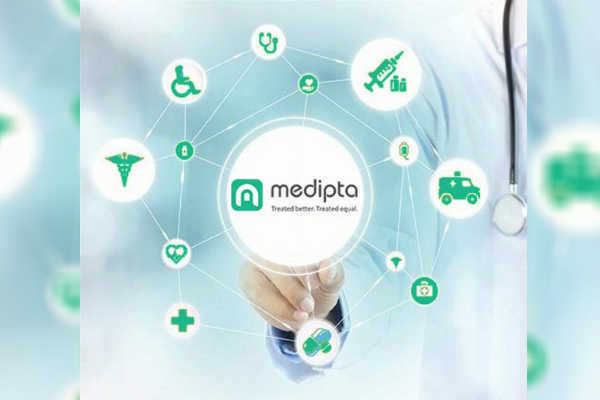 Medipta is an app where all the entities of healthcare services are getting connected with user-friendly digitalisation. Medipta app is available on mobile and web for healthcare providers to give services. Everything will be saved on cloud and it will be easy to share online reports, prescriptions. It will save time of healthcare providers as well as of patients. Why do you call yourself a 360 degree platform that serves healthcare needs? We are serving anything and everything in healthcare services. Medipta connects patients, doctors, diagnostic labs, chemists, hospitals, blood banks, ambulance, insurance agents, fitness experts, telemedicine and preventive health check-up devices. We also customise the best healthcare packages understanding your financial conditions. And not just that, this smart platform also offers suggestions for your family’s stay at hotels near the hospital. It provides data on doctors, appointment booking, cost analysis and best available treatments in addition to an exhaustive database on pharmacies and diagnostic labs nearest to you. A virtual cloud fed with all your medical records can be accessed by your doctor, pharmacist and lab technician to ease your hassles with paperwork and repetitive visits. Tell us about the funding and revenue? Medipta is completely based on my bootstrap money so far. There is some small strategic investment by e-Zest Solutions. How does bootstrapping help a start up to be sustainable? I am a serial entrepreneur. My experience says, one of the considerable challenge for a start- up is finding reliable ways for funding. Using your own capital to make your start-up grow, is also very much challenging. I chose bootstrapping. It may limit my plans for initial few years, but at the same time you need not worry about the demands of outside investors. If you have skill to manage your finance then you can sustain in the market. Can you tell us about e-Zest Solutions’ investment share or how they are involved with your company? e-Zest Solutions invested money in Medipta as a strategic investor one year back. They found some unique features in Medipta and its expansion plan, and that is why they are helping us for our product strategy. What are your strategies to create brand awareness? We have launched this product recently. To increase awareness of the app, we are using social media optimally. Electronic media ads would be out soon. Simultaneously, we are aggressive on strategic partnerships. Association with MSCDA is an outcome of it. Few more partnerships for larger reach and brand awareness is in pipeline. Every healthcare service provider player in the market is our potential partner and we welcome them to associate for mutual benefit. In near future, our new project called ‘Aarogya Setu, part of Medipta, would soon be out in public domain. How are you building more partners for your business? Medipta is an app with unique features. We are not those who pitch their products to investors. We are those who are open for partnerships. Medipta considers every other healthcare provider as a colleague who are serving in the industry, and we welcome them to partner on different fronts for a larger benefit of all.